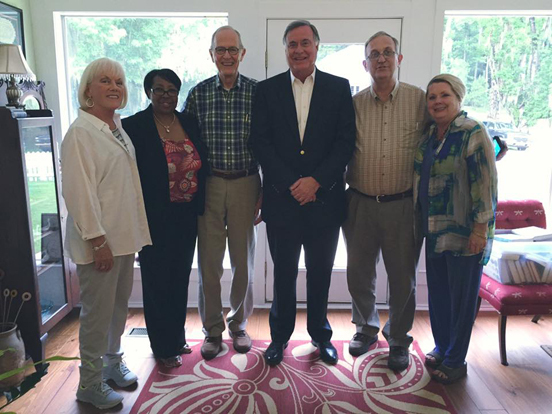 While visiting Grove Hill, Flowers chatted with radio talk show host Deborah Rankins (The Rankins Files), who said, “I applaud him for preserving Alabama’s colorful political history with such great humor. 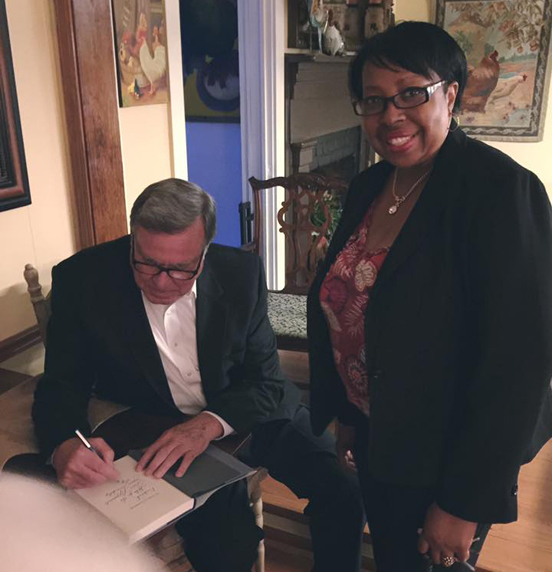 Generations to come will enjoy his stories.” Added Gordon, “Several of our book club members have said they wished Steve would run for governor. Two or three have even offered to help him campaign.” Now there’s an idea! As Confederate symbolism, hostility to immigration reform, voting rights, and Donald Trump mania roil the waters of Deep South politics in the run-up to the 2016 elections, Steve Suitts reveals the irony in a Southern Spaces blog post that white ex-Confederates were early beneficiaries of U.S. amnesty for illegal aliens. Suitts, author of Hugo Black of Alabama: How His Roots and Early Career Shaped the Great Champion of the Constitution, is an adjunct lecturer at Emory University, senior fellow at the Southern Education Foundation, and the former director of the Southern Regional Council. He is a native of Winston County, Alabama. 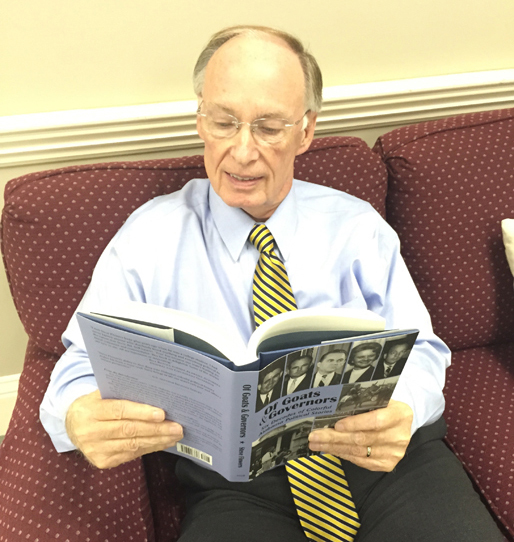 Hugo Black of Alabama is available from NewSouth Books or your favorite bookstore. Talking politics is a favorite Alabama pastime. At long last, a generation’s worth of tales “you couldn’t make up if you tried” has been collected and delightfully recounted by Alabama’s leading political commentator, Steve Flowers. 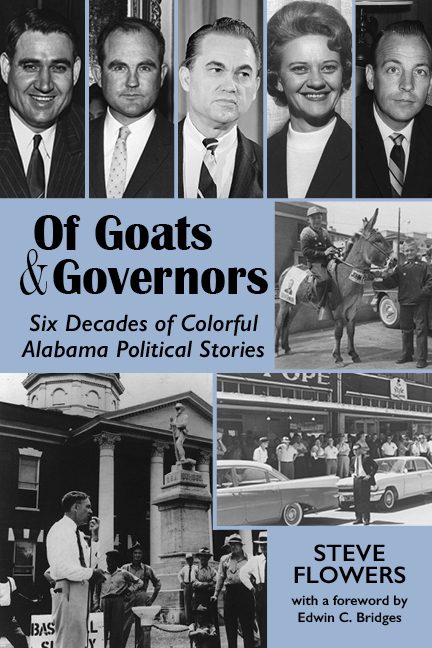 Of Goats & Governors: Six Decades of Colorful Alabama Political Stories, just published by NewSouth Books, is off to a stellar launch with Governor Robert Bentley among its first readers. Steve Flowers is being featured in newspapers and radio and television interviews as he travels to book events across the state, where he share stories from his rich collection of tall tales and small tales about famous and lesser known Alabama politicians of the twentieth century, including the likes of Howell Heflin, Big Jim Folsom, and others. There is nobody better to relate this history than Flowers. 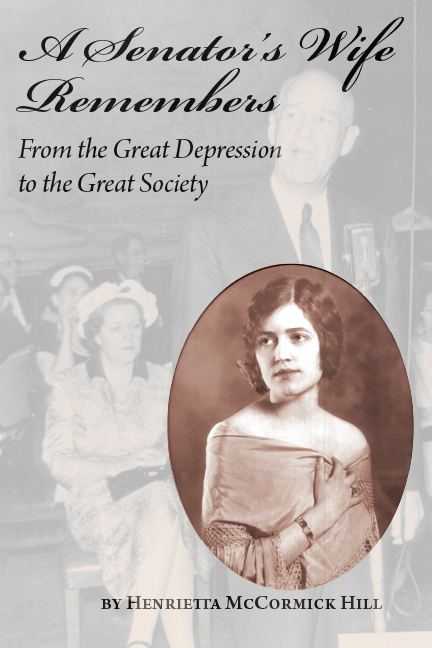 The Troy Messenger recently profiled Flowers on the occasion of the book’s publication. Flowers told the paper, “Few states have as fascinating a political history as Alabama. I was fortunate to have rubbed elbows with some of the most interesting figures in 20th-century American government and politics.” The article recounts Flowers’s career in Alabama politics from legislature page through representative through his current occupation as the state’s leading political commentator. Flowers’s book talks have been featured in papers including the Cullman Times, Trussville Tribune, and the Daily Mountain Eagle. Flowers launched the Of Goats & Governors book tour in Cullman with a visit to the Cullman Times, a talk to regional realtors, and a signing at Deb’s Bookstore. Flowers stopped at the Haleyville Library next and went on to Jasper with a visit to the Daily Mountain Eagle and a presentation at the Walker County Republican annual summer meeting. Through the fall, Flowers will present at over 40 other venues including the Alabama Department of Archives and History in Montgomery (October 6) — Governor Robert Bentley will attend the reception — the Birmingham Library (October 22), and the Auburn University Library and East Alabama Museum in Opelika (November 12). Anniston Star publisher H. Brandt Ayers’s explores “the making of a Southern liberal” in his new memoir, In Love with Defeat. To some, a “Southern liberal” might be an oxymoron, something Ayers discusses in his book and that two new reviews of In Love with Defeat have picked up on. As an example, Yoder cites the formation of the L. Q. C Lamar Society by Ayers and others, intending to preserve the South’s cultural legacy while attracting new business opportunities to the South. They were ultimately overwhelmed, as Ayers describes in In Love with Defeat, by progress that eroded Southern culture; Ayers compares the thoroughly modern Atlanta to Charleston and Savannah that still preserve the Southern aesthetic. Martin spotlights the end of Ayers’s book, in which the author “is still caught between his liberal leanings and his identification with Southerners who do not share those views. … Maybe it is a tough puzzle to understand, but [as] former Mississippi Gov. William Winter says, Ayers comes ‘as close to explaining who we Southerners are and why we act as we do,'” even if that explanation comes in the form of recognizing the contradictions inherit in the Southern identity. Read D.G. Martin’s review, archived in the Charlotte Observer, and Edwin Yoder’s review from the Weekly Standard. 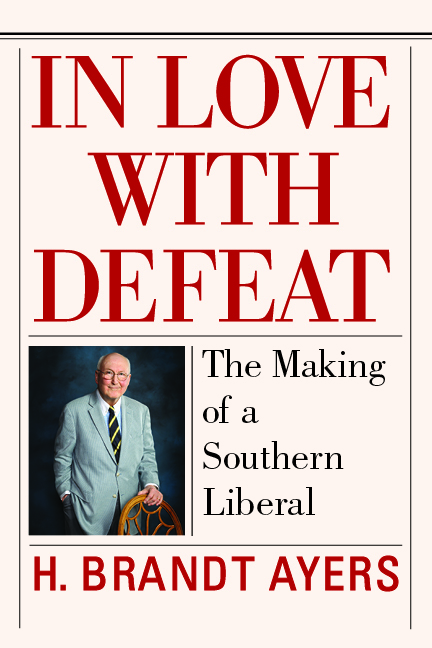 In Love with Defeat: The Making of a Southern Liberal by H. Brandt Ayers, is available in hardcover and ebook from NewSouth Books, Amazon, or your favorite bookstore. Hal Crowther of Oxford American has reviewed two new books about “the Southern mind,” including Anniston Star publisher H. Brandt Ayers’s In Love with Defeat: The Making of a Southern Liberal. In Love With Defeat is a book that thoughtful Southerners — and ignorant outlanders — would do well to read and ponder. During the civil rights struggles that began in the ’60s, most whites in the Deep South were faced with the same choices that faced Ayers. Unique to him, as the owner of a small-city daily, were his leverage, access, grave responsibility, and direct exposure to the consequences of his decisions. Every Klansman knew what he thought and where he lived. … Those like Ayers … knew that a bullet through the window or a bomb in the garage were everyday possibilities. But In Love with Defeat, as Crowther notes, is more than “just” a memoir. Ayers chronicles the rise of the “New South” movement, including Ayers’s early presidency of the biracial, progressive L.Q.C. Lamar Society, and how the group disbanded amidst the growing Republican majority in the South. Ayers explores the mindset of “the adamantly unenlightened who cling to the South’s lost cause and all the grim failures that followed from it,” and devotes much of the end of In Love with Defeat to considering politics and the South — what influences currently act on the South, and what expectations Ayers has for the future. Read Hal Crowther’s “The Mind Revisited” at the Oxford American website. In Love with Defeat: The Making of a Southern Liberal by H. Brandt Ayers is available from NewSouth Books, Amazon, or your favorite bookstore.